Pareto Chart is based on the Pareto principle (also known as the 80/20 rule), which is a well-known concept in project management. According to this principle, ~80% of the problems can be attributed to about ~20% of the issues (or ~80% of your results could be a direct outcome of ~20% of your efforts, and so on..). The 80/20 percentage value may vary, but the idea is that of all the issues/efforts, there a few that result in maximum impact. This is a widely used concept in project management to prioritize work. Simple (Static) Pareto Chart in Excel. Dynamic (Interactive) Pareto Chart in Excel. Creating a Pareto Chart in Excel is very easy. All the trickery is hidden in how you arrange the data in the backend. NOTE: To make a Pareto chart in Excel, you need to have the data arranged in a descending order. Set up your data as shown below. Select the entire data set (A1:C10), go to Insert –> Charts –> 2-D Column –> Clustered Column. 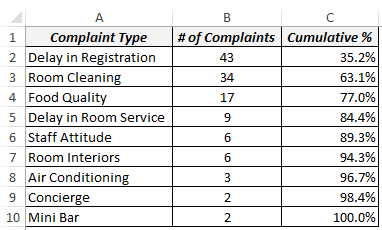 This inserts a column chart with 2 series of data (# of complaints and the cumulative percentage). Right click on any of the bars and select Change Series Chart Type. In the Change Chart Type dialogue box, select Combo in the left pane. 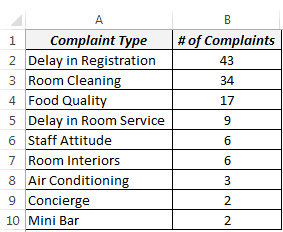 # of Complaints: Clustered Column. Cumulative %: Line (also check the Secondary Axis check box). Your Pareto Chart in Excel is ready. Adjust the Vertical Axis values and the Chart Title. 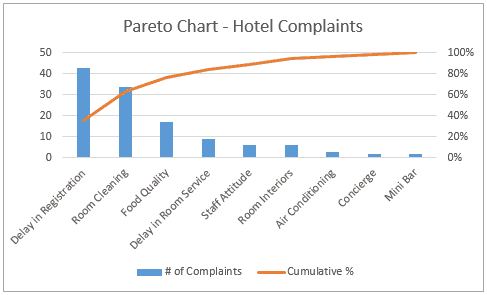 This Pareto chart highlights the major issues that the hotel should focus on to sort the maximum number of complaints. For example, targeting first 3 issues would automatically take care of ~80% of the complaints. For example, targeting the first 3 issues would automatically take care of ~80% of the complaints. Now that we have a static/simple Pareto chart in Excel, let’s take it a step further and make it a bit interactive. In this case, a user can specify the % of complaints that need to be tackled (using the excel scroll bar), and the chart will automatically highlight the issues that should be looked into. The idea here is to have 2 different bars. The red one is highlighted when the cumulative percentage value is close to the target value. In cell B14, I have the target value that is linked to the scroll bar (whose value varies from 0 to 100). In cell B12, I have used the formula =B14/100. Since you cannot specify a percentage value to a scroll bar, we simply divide the scroll bar value (in B14) with 100 to get the percentage value. This formula returns the cumulative value that would cover the target value. For example, if you have the target value as 70%, it would return 77%, indicating that you should try and resolve the first three issues. Select the Data in Column A, C, D & E (press control and select using mouse). 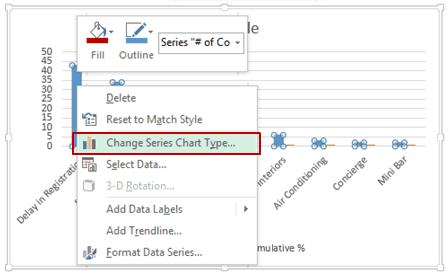 Right-click on any of the bars and select Change Series Chart Type. Cumulative %: Line (also check the Secondary Axis check-box). Right-click on any of the highlighted bars and change the color to Red. You have created an interactive Pareto Chart in Excel. Now, when you change the target using the scroll bar, the Pareto chart would update accordingly. Do you use Pareto Chart in Excel? Analyzing Restaurant Complaints using Pareto Chart. Creating a Bell Curve in Excel. 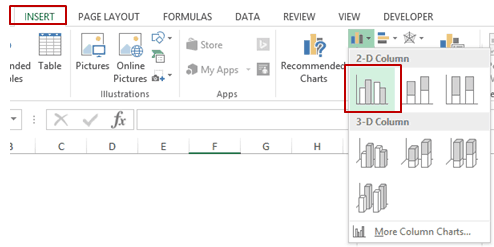 How to Add a Secondary Axis in Excel Charts. The error in the formula is fixed by making the last reference B10 instead of B1. B10 is the last cell in the column of data. You also have to multiply by 100 to get percentage. I’m not able to get the cumulative percentage to work. The first line says 100% and then the rest are in the thousands of percents? My Excel cannot open the “developer” can you help me how to do this? Thanks for sharing this to us. Really big useful to me. 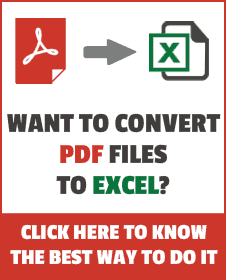 Learn Excel Online – Free Online Excel Training Course – Improve Excel Skills. Excel Everest is one of the reputed institutes for Online Excel Course in UK. Help, steps 9 onwards don’t work for me! Everything else is great just can’t get the bars to change colour. Got asked to do my first Pareto Graph today. By the end of the day, I had produced what I refer to as a “Live Pareto Graph”. All the data is compiled and resorted on the fly as data within the spreadsheet is changed. This can be real handy if you need multiple people to manipulate the project. Less steps to train. l like this blog Excel Everest offers Microsoft ExcelTutorials: Our administrations are Microsoft Excel Training, Online Excel Training,Excel Courses. Have you linked the target cell with the scroll bar value? If I add a value of 0 (Zero) in the complaints column the chart is no longer sorted from high to low. Sumit – nice post – love your creative thought process. One question – does this make sense? I added another IFERROR function to the overall INDEX formula so that if you have a 100% target it registers 1 (100%). I was getting a #REF error otherwise. Hi Mike.. I just noticed the #REF error at 100%. I have updated the article and the download file.. Thanks for sharing..You are awesome! However, the dynamic one highlights one colum to much, e.g. for 80% 4 columns are highlighted, but – as you mentioned – 3 would be correct, i.e. INDEX($C$2:$C$10,MATCH($B$12,$C$2:$C$10,1)). Furthermore, you won’t need an additional column for the remaining bars if you optimize the order of the other columns. Hi Frank.. Thanks for commenting..The reason I highlight 4 columns for 80% is because 3 columns would constitute only 77%. So I take an additional value (uptill 84.4%). But if you need it to be 3 only, then your formula is the way to go. I liked this !!! Well in my Excel 2010 (Std. ), the combo option is not available. However, I could select individual series and could do it. Hi Yogi.. Thanks for commenting.. Glad you liked it 🙂 You are right! 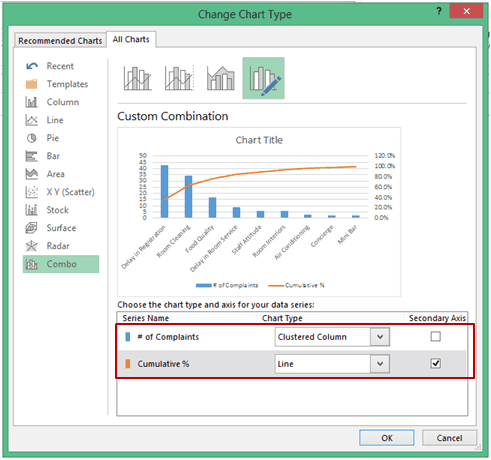 Excel 2010 doesn’t have the combo option, but it can be done using chart type. Nice work. I really like the dynamic slider. Hi Terry.. Thanks for commenting.. Glad you liked it! Thanks for commenting Ferriyah.. Glad you found it useful!